Pics or it didn’t happen: Would you climb a mountain without posting pictures? Hiking and photography go together. But will you hike without posting pics? The question itself was rhetorical. But people answered. “Absolutely. My camera is my least important piece of equipment. If I did not carry my phone for navigation I would likely take even fewer pictures than I do,” one responder said. I believe these folks, as well as the others who more or less said the same thing. Based on what they’ve posted, many of them are pretty serious about their outdoor undertakings. They hike and climb for the sake of the activity, not because they want to be able to say that they’ve done it. But I also know that there are those who probably would not climb mountains if they couldn’t take photos, or share the experience on a blog or via social media. In fact, many of them are trying to get new images for the sake of keeping those platforms stocked with new things for people to look at, comment on, or hit “like” or whatever. I also know the nature of the question (and the responses that followed) probably discouraged these folks from answering that no, they wouldn’t climb if they couldn’t share. To admit it would seem shallow. That’s the part I want to break down, because I think there are a couple of reasons that push people toward this side of the outdoor world. For some, it really is a question of meeting demand. Many hikers, climbers, mountaineers or whatever have websites that need new posts. They’ve got social media channels that need fresh photos and videos. Sponsorships might be part of the deal, or perhaps a larger prize down the road that will pay off if all these online efforts showcasing their adventures hit some sort of critical mass. So yeah, that’s pressure to get out there more, push harder and provide new stories to tell online audiences. For others, it’s simpler. They’ll hike a mountain, or climb a pitch, get a dramatic photo, and post it. Soon thereafter, folks are double-tapping that image like crazy and their phone is blowing up with likes and comments from enthralled followers. It’s a symbiotic stimulus-response reaction between the person and their audience. For the followers, it’s a matter of expressed appreciation. For the poster, it’s validation. And validation is a powerful drug. A numbers game follows where the tally of likes and followers drives these folks to see what image will garner even greater numbers. Most of the time, this is pretty harmless. If it floats your boat, you do you, man. While there are examples of people trying things in places where they get in over their heads (sometimes with deadly consequences), those are rare exceptions. I asked the question following a trip to Colorado for a family wedding. I had a day after the ceremony where I could head up into the mountains and maybe hike a trail and bag a peak. Might as well, right? But it had snowed pretty hard in the high country, and I’d left my ice axe at home. I read a report that a hiker had a near-miss with an avalanche in the Indian Peaks Wilderness. And someone else lost control of their car at Loveland Pass, with icy conditions sending them down the mountainside. I took a pass. And yet, part of me regretted not going up, especially after seeing some friends’ pics in the hills at the same time I’d planned to go. Was it fear of missing out? Or fear of missing the opportunity to take a bunch of photos of snowy alpine scenes, writing a trip report, and posting fresh images on the IG? And that brought up a deeper question: What’s my overriding motive? I’m a storyteller by nature, be it with words or pictures. I enjoy it. But I’d hate to get to the point where every outing has to be justified by fresh content for all the interwebz to consume. Worse yet, I’d hate if it turned into something where I planned all my trips on the basis of what new thing I can publish. In other words, I needed to check myself. Hence the question. I can say yeah, I’d climb a mountain if I couldn’t take pics or post about it. I have before, and I enjoyed the experience just fine. I’ve done plenty of hikes without snapping a single shot. Those were good, too. And so were the ascents and hikes where I took dozens of photos. But I don’t want to get to the point where I’m hiking for the approval of others. I never want to make the hike akin to a job, where it must be done and documented or it’s not worth my time. That would signal a loss of the love for the outdoors, and that would be far more tragic than not seeing a bunch of affirming notifications pop up on a hand-held screen. My next hike ought to have no photos taken. Or at least I should give myself that option. Last fall, we saw a lot of people on Facebook and Instagram doing the “black-and-white photo challenge,” where you take one black-and-white photo each day for a week. The rules: No selfies, no people, no caption or explanation. I got challenged, did some pics, and had a little fun. I’m not sure why, but I liked this. The “challenge” was cool, and I enjoyed seeing what other people posted. Yes, it’s dorky. Yes, it’s another social media deal where everyone plays along like a bunch of sheep. But who cares? It was harmless fun, and for those who like taking photographs it was a great way to break up the usual stream of angry or selfie-ridden posts that dominate these platforms. Anyway, I figured it would be fun to look back at those pics. And this time, I’ll be including captions. (I’m a rule-breaker) As you’ll see, my life isn’t just a constant stream of landscape photos and outdoorsy bliss. Pretty much this, six days a week. Every runner and hiker has a pile of shoes, right? So many miles sitting there. What I look at during work hours. This is where I park. These things go with me everywhere. I go here a lot. You didn’t think I’d do this without some woodsy scenery, did ya? So there you have it. Little slices of life, photographically represented in black-and white. Did you do something like this? If you’re a blogger, it would be cool to see if you did this and stick it in a link. Paste it in the comments. Let’s see your life in black-and-white. Sweet trails at Loveland Pass, Colo.
Spring is upon us, and that means a bunch of people are going to crawl out of their winter holes and hit the trails. Some of us like those winter trails, too, but for most of the public, spring and summer is where it’s at. Summit trail on Mount Lincoln, Colo. The route down from Broken Hand Pass to Cottonwood Lake, Colo., Sangre de Cristo Range. Snowy scene from near the trailhead at Turkey Mountain, Tulsa, Okla. Summit ridge trail on Missouri Mountain, Colo. Happy backpackers on the trail up to Chicago Basin, Colo., Weminuche Wilderness. Ledge-y section on the Southwest Ridge of Mount Sneffels, Colo.
Denney Creek Trail up the slopes of Mount Yale, Colo. Going up toward the summit pitch on Uncompahgre Peak, Colo. Approaching the saddle on Mount Shavano, Colo. These are just a sampling. I’ve got a lot of good hiking memories. I don’t know about you, but I’m ready to hit the trail right now. Happy hiking, folks! Sunrise on the Longs Peak Trail, Rocky Mountain National Park, Colorado. Two short facts about me: I love the mountains, and I like to take pictures of them. I’m not a great photographer, but the cool thing about the mountains is their very nature can make a mediocre photographer look pretty good. Peak 18 and Windom Peak, Colorado. This was taken in a break in the weather during a soggy backpacking and peak bagging trip in southwestern Colorado. We spent hours in our tents waiting for the weather to improve. The occasional lulls in the rain gave us scenes like this. Looking down the trail on Cupid. Front Range, Colorado. Last summer, the weather — again — conspired against me. But I found a brief window near Loveland Pass to do a solo hike of Cupid, a 13,000-foot peak along the Front Range. Gray skies, snow patches and loads of wildflowers made this sweet stretch of singletrack one of the more memorable images I have. While driving to Black Mesa, Oklahoma, I drove through a patch of short peaks and mesas in the northwestern part of the state that caught my eye. I love the lines in this one, from the high, wispy clouds in the sky to the fence line in the foreground. Added to that, the textures of the mountain itself. It’s not a big mountain, but it sure is pretty. Holy Cross Ridge, near Minturn, Colorado. I took this photo from the summit of Mount of the Holy Cross. The camera is not a good one — from an iPhone 3 — but the profile of the ridge, the snow, and the way the sun was hitting it made it pretty striking. Another one from the iPhone 3. I snapped this one hiking down the mountain, and the timing was good — a storm was forming over the top of the peak. It’s always good to get below treeline before storms roll in, and it made for a cool image as well. Longs Peak, Rocky Mountain National Park, Colorado. Longs Peak is one of the most photogenic mountains I’ve ever seen. It’s big, dramatic and wild. It will test you, but it will also reward you with vivid, dramatic scenery that look great in pictures. I might add that pictures do not do this mountain much justice. Summit ridge on Missouri Mountain, Colorado. Another memorable solo outing. Dodgy weather almost made this one a no-go, but conditions held long enough to bag the summit. While on the ridge, swirling clouds made this part of the trail appear to vanish into the mists. It was surreal and amazing to hike this stretch of alpine singletrack. 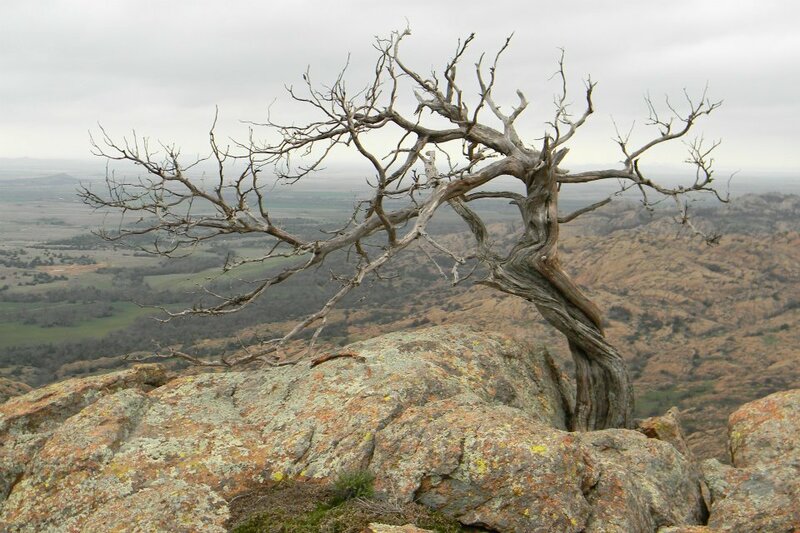 Mount Mitchell, Wichita Mountains Wildlife Refuge, Oklahoma. I cut my teeth on Class 3 and 4 climbing on this one. This scene framed itself nicely. The light in the sky is a little flat, but I liked the way the mountain is reflected in the water, and how you can see all the grooves in this ancient granite crag. 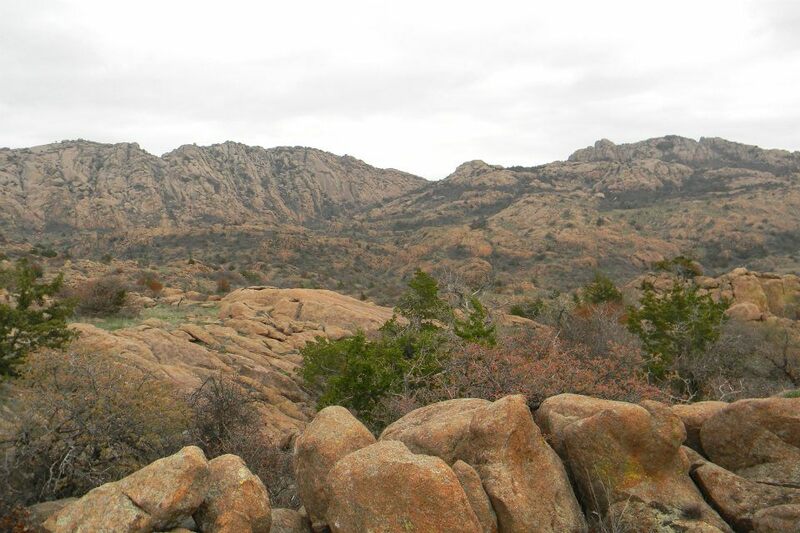 The Wichitas are hundreds of millions of years old, but still stand proudly over the western Oklahoma prairie. Northeastern San Juan Range, near Lake City, Colorado. You can see four 13,000-foot peaks in this one, graced with late spring snow — Coxcomb, Redcliff, Precipice and Heisshorn. The suncupped snow in the foreground is actually the summit of Wetterhorn Peak, which contrasts nicely with the peaks in the middle of the frame and the skies far to the north. Breathtaking scenery atop my favorite mountain. Overlooking the Angel of Shavano Coulior, Mount Shavano, Colorado. A shot of one of my adventure buddies, Johnny Hunter, on our first snow climb on Mount Shavano. The sweeping lines of the trail, the couloir and the saddle of the mountain, combined with the sky in the background, just screams “spirit of adventure” to me. Another one from Mount Shavano. This was taken less than a hundred feet from the summit. Johnny is paused here, looking up. To me, this captures the moment when you realize that victory is near — the hard work, physical strain, whipping winds — all of it is converging on a slice of time when you’re about to top out after a big day on the mountain. It’s a sweet feeling that keeps us coming back for more. Summit of Uncompahgre Peak, near Lake City, Colorado. My official “sweaty palms” photo from the top of the San Juans’ highest mountain, Uncompahgre Peak. 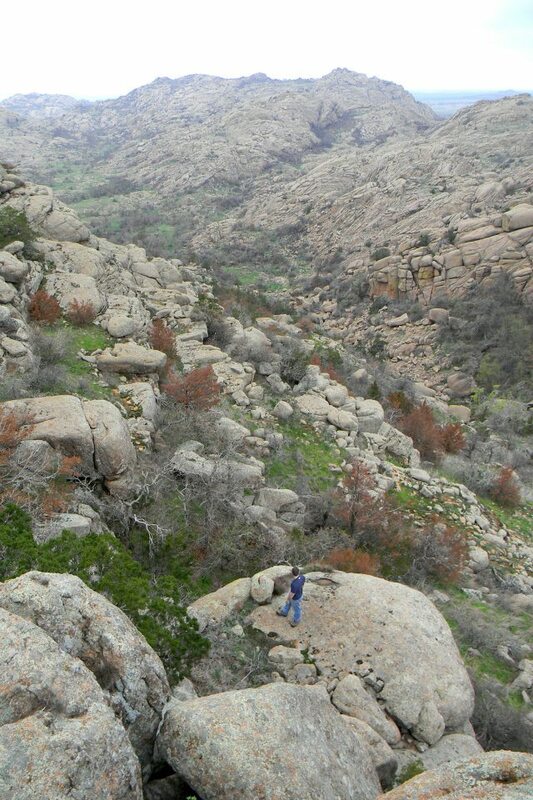 It’s a simple hike to the top with a small stretch of scrambling near the summit. But the north face cliffs are sheer. This shot is looking 700 feet straight down. Looking east from the summit of Uncompahgre Peak. Rain and graupple falling to the east gave these peaks a frosty appearance over the Labor Day weekend of 2009. A very moody image that shows how the weather and mountains interact. My favorite mountain, Wetterhorn, as seen from the summit of Matterhorn Peak. Wetterhorn offers so many dramatic profiles and is an incredible (and surprisingly accessible) mountain to climb. The spiny connecting ridge between the two mountains offers a little more visual spice that symbolizes the wildness of the San Juans. So there you have it. You’ll notice that all of these are from two states. I’ve hiked and climbed mountains in New Mexico, Montana, Tennessee and even China, but it is coincidence that my favorite mountain pics come from the two states — Colorado and Oklahoma — where I’ve lived the longest. I’d like to see your favorite mountain pics. So here’s what I’m proposing: Go to the Proactiveoutside Facebook page (please “like” it if you haven’t already!) and put your best mountain pic in the comments that accompany this post. Include a brief description of what mountain we’re looking at, where it is, and any other interesting information about the image. If I get enough, I’ll compile them and post them in a future blog of your best images. So let’s see em! Surprising architecture seen on the run in downtown Tulsa. Not too long ago, I wrote about how you see a city much differently on foot than you do from inside a car. The car can be isolating, so much so that it even dictates where in a community you tend to go. When you’re on foot, things look, smell and sound much different. It’s a more intimate experience, good or bad. In the past, I’ve tried to pack in a run or two in every city to which I’ve traveled. Whether it’s for a race (Oklahoma City comes to mind) or business (Washington, D.C.), taking a tour of a city on foot has a much different feel than hitting the highway. But how well do we get to know our own communities? How much have you explored your own city? This is hard to do if you train only in a specific park or put in most of your miles at a track or on a treadmill. 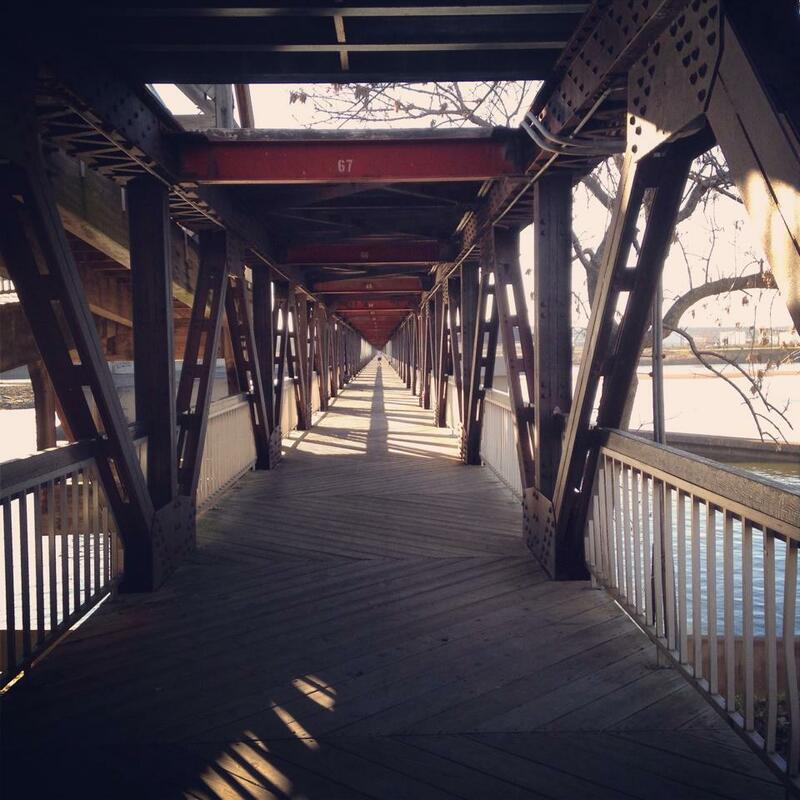 Since moving to Tulsa nearly three years ago, exploring the city via the run has been a conscious — and worthwhile — practice for me. When I tell people I live in Tulsa, most people think about the plains, oil derricks, red-state stereotypes and so forth. Honestly, I felt the same way when coming here as a teen many years ago (I’ve lived here before), and when I took a job here I wasn’t all that fired up about it. But the city has surprised me, and has revealed itself mostly through its interaction with me as I pound out the miles. My guess is what you think you know about it (if anything) and what it actually is are two different things. Over the past couple of years I’ve taken moments here and there photographing the places I run. So let’s take a tour. 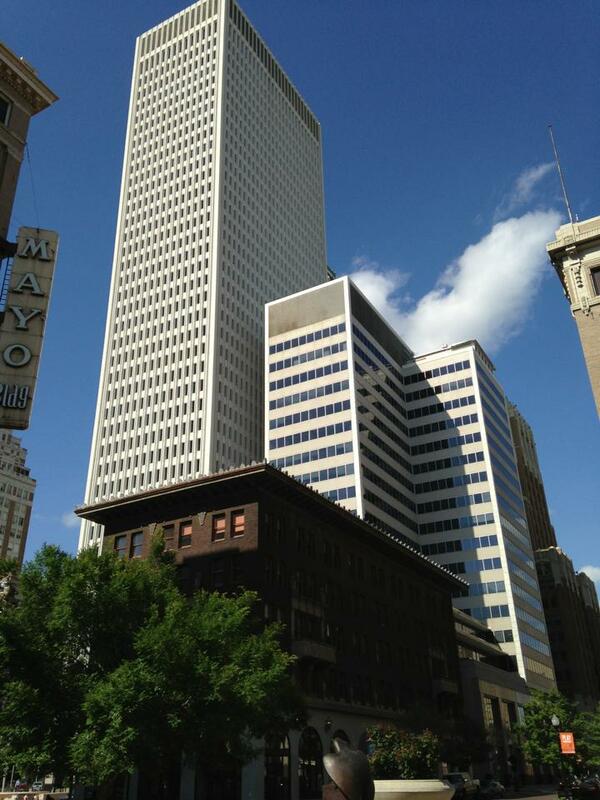 Tulsa is Oklahoma’s second-largest city, a hub for energy, banking and aerospace. There are about 400,000 people living in the city and nearly a million in the metro area. As such, it’s developed a pretty stately downtown. 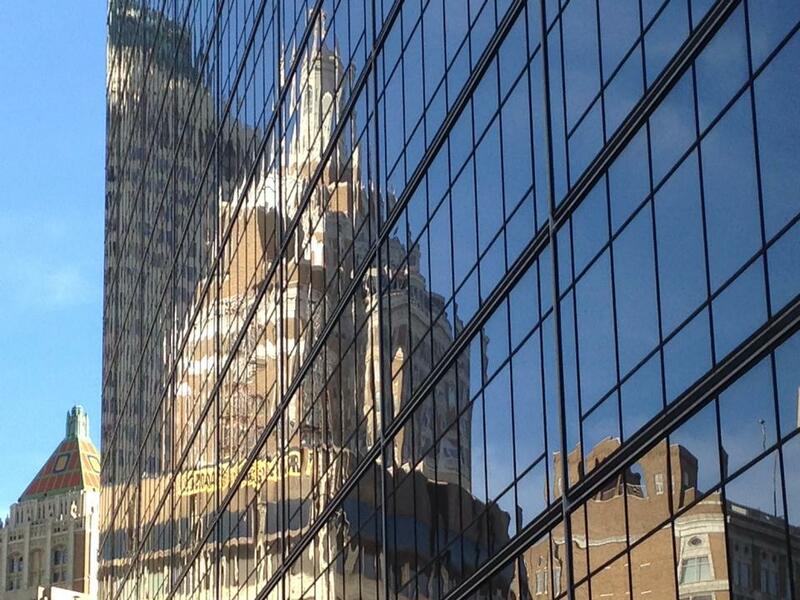 A 1920s-era highrise, the 320 South Boston Building, reflected on a more modern glass tower. The contrast of old-style art deco and modern architecture is beautiful. Dramatic highrises cast long shadows over some of the city’s older, classic buildings. It’s fun running through places like this. Part of any city’s growth these days is reclaiming run-down areas and making them new. These are places where people now gather for fun while not forgetting the city’s past. 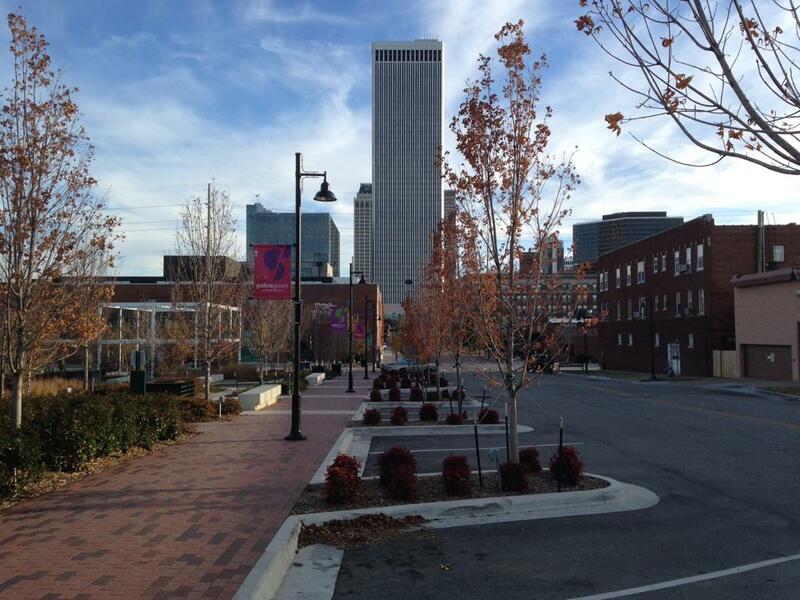 Downtown Tulsa as seen from the Brady Arts District. Brady used to be a rundown warehouse district, but is now home to a number of galleries, restaurants, pubs, music venues and a sweet little park that is home to live music and food trucks. A free outdoor music festival last summer drew some 40,000 people here. I run here a lot, and there is usually something pretty cool to see. The center of what used to be the center of the Black Wall Street. 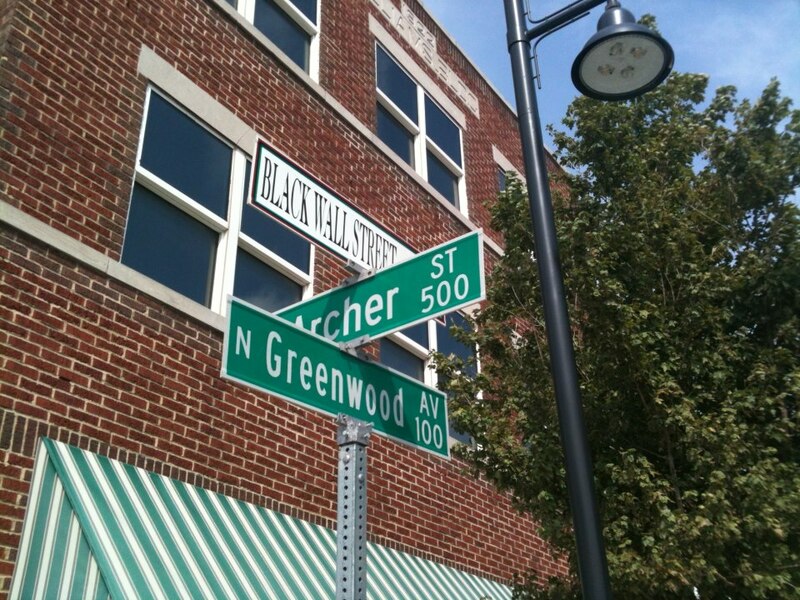 Before the race riots of 1921, this was a prosperous commercial district for Tulsa’s black community. It’s since been revived, but in a different way. Running here spurred me to learn more about the riots and how that still affects the city today. 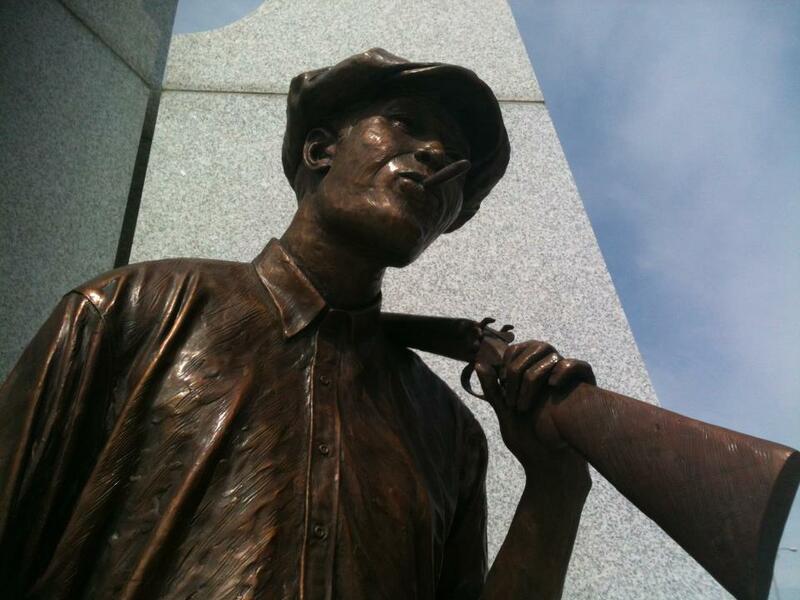 One of the statues at Reconciliation Park, which memorializes the Tulsa Race Riots. The park is on the Brady District’s north side and is worth a visit. I run through here at least a few times a week. 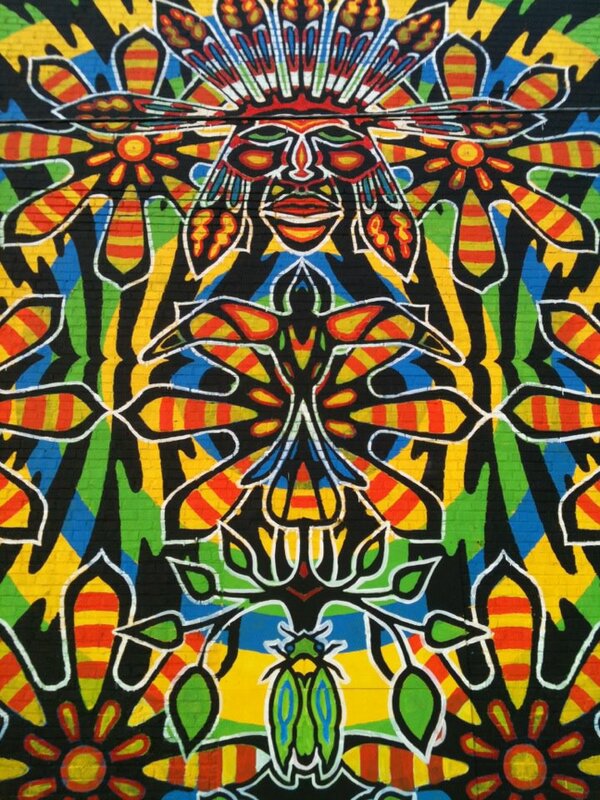 An Aztec-style mural in the Blue Dome District in downtown Tulsa. There is a lot of mural art throughout downtown. Green spaces are a big deal here. Northeastern Oklahoma has been dubbed “Green Country” by some (personally, I think that’s a TV marketing thing), and it fits. We’re on the eastern edge of the Ozarks and we do trees here, a stark contrast to the more open prairie that exists further west. As such, the parks have a pretty green feel to them, and people take advantage of it when the weather is good. Lots of folks enjoying some nice weather at River Parks. 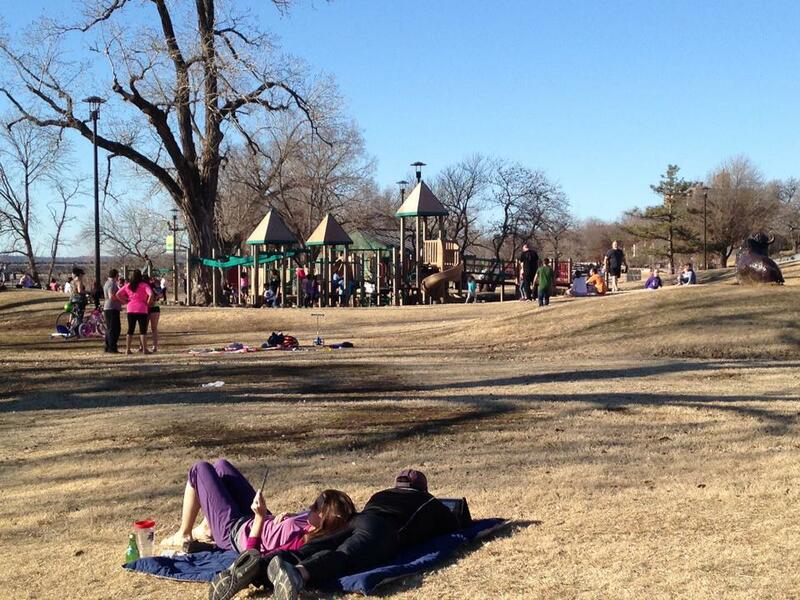 This stretch of parks along the banks of the Arkansas River is a favorite place for runners, walkers, cyclists and people just wanting to hang out. I run here a lot. The River Parks pedestrian bridge connects the east and west bank trail systems that line the banks of the Arkansas River. It’s also a photogenic little span. 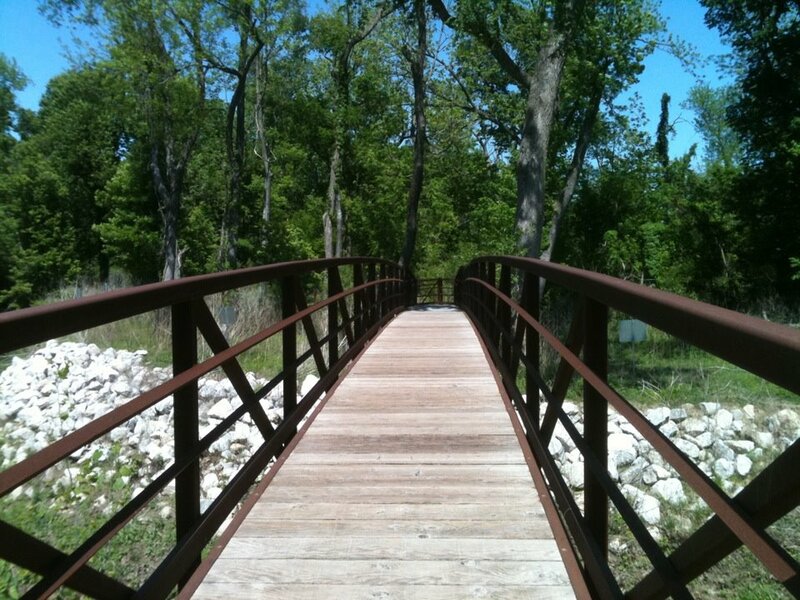 Another bridge, this one at south Tulsa’s Haikey Creek Park. This is a nice green space with an unpaved trail loop. It also is a hotspot for disc golf enthusiasts. If you’ve read this blog at all, you know that I have a trail running haunt that’s about 15 minutes from my doorstep. 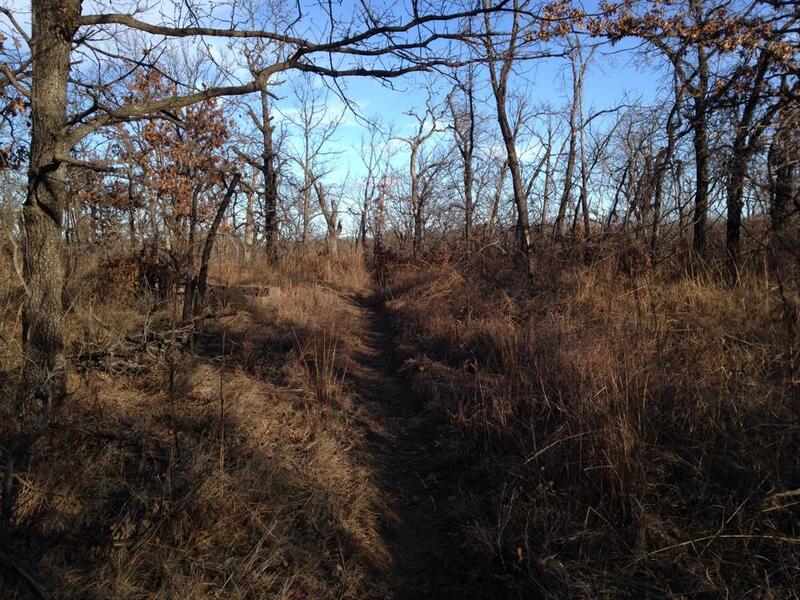 Turkey Mountain Urban Wilderness is a rarity in Middle America. It’s not really a “mountain” per se, but instead some rugged, wooded ridges that were set aside by the city and a charitable trust for the purpose of keeping some of the natural environment of the area free from commercial or residential development. It’s turned into the city’s top destination for trail runners, mountain bikers, horseback riders, hikers and anyone else just wanting to get away from suburbia or work worries and just walk in the woods for awhile. I’m an all-season guy, so I’ve seen Turkey Mountain in its various seasonal aspects. 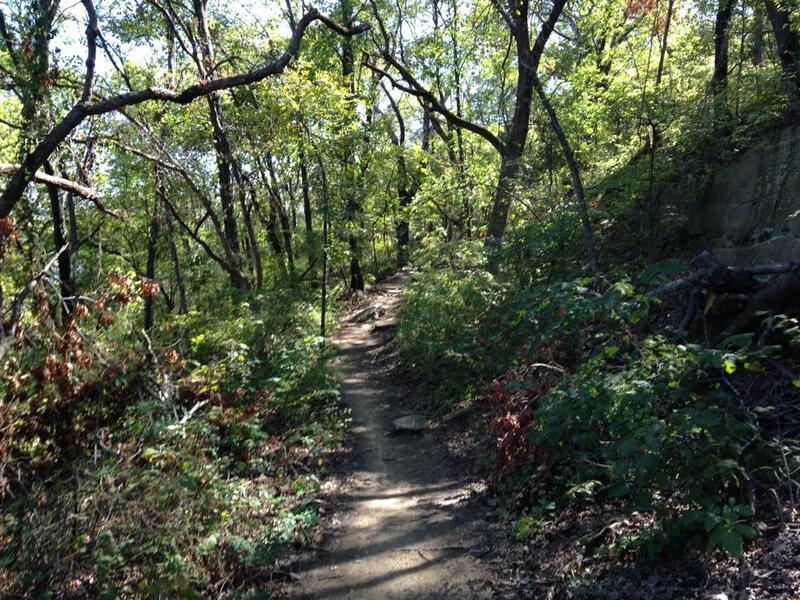 A wood-lined section of Turkey Mountain’s Ho Chi trail during the summer. The scores of miles of trails here offer some of the most challenging trail running and cycling trails you can find. 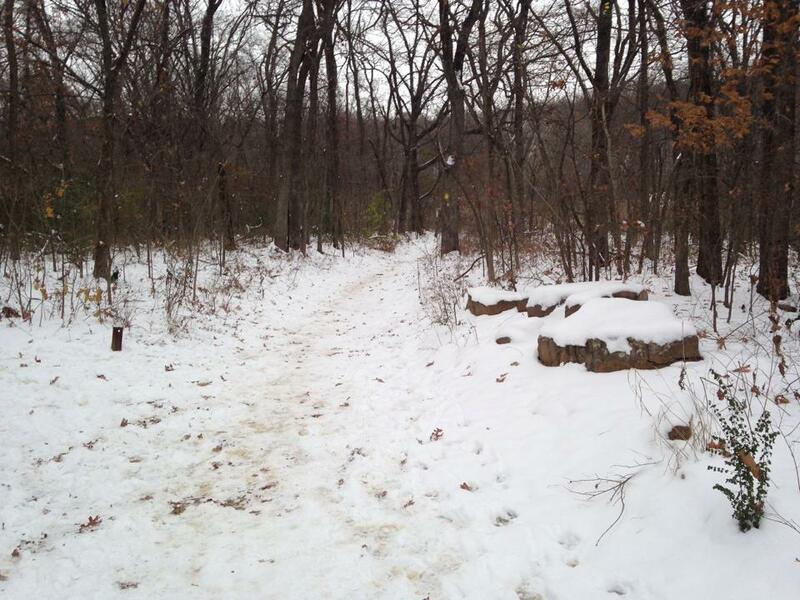 Late fall and winter conditions on the Snake Trail at Turkey Mountain. Sweet singletrack. Sometimes we get snow, and when we do, Turkey Mountain is a lot of fun. There is a lot more to the city than what I’ve pictured here, way more to explore. And sure, there are some places that aren’t so great or are just kind of boring. But that’s the beauty of exploration. Had it not been for my running habit (and my compulsion to get outside), there are many parts of the city I would never have seen. I definitely have my favorite spots (my “urban trail), but I’d like to see more. So go ahead. Lace up those shoes, find a place in your community you’d like to see and map out your run. You might be surprised at the experience. It’s way different on two feet than it is on four wheels. I wouldn’t call myself a social media skeptic. Rather, I just don’t want to get so “networked” that I spend a bunch of my free time updating a bunch of websites. But after consulting some pretty savvy members of the Twitterati, I decided to make the jump to Instagram. It seems I take a ton of pictures anyway, right? So here’s the deal. I’ve been busy downloading some of my favorite photos from hikes, climbs and runs. And there will be other stuff, too. But the heart of it is going to be photographically capturing the cool moments of a hike, an ascent or a run. And you should, too. See something awesome during your early morning run? Like an incredible sunrise? Or cool urban scenery? Shoot it, post it on Instagram and hashtag it with #seenontherun . Or how about your best pics from a hike? Same deal, but a different hashtag: #seenonthetrail . I’ve been doing this on my photos thus far, and you can see them by searching those hashtags. There are some good ones! Let me see yours! So feel free to look me up on Instagram at Proactiveoutside, or online at http://instagram.com/proactiveoutside . See ya on the IG! 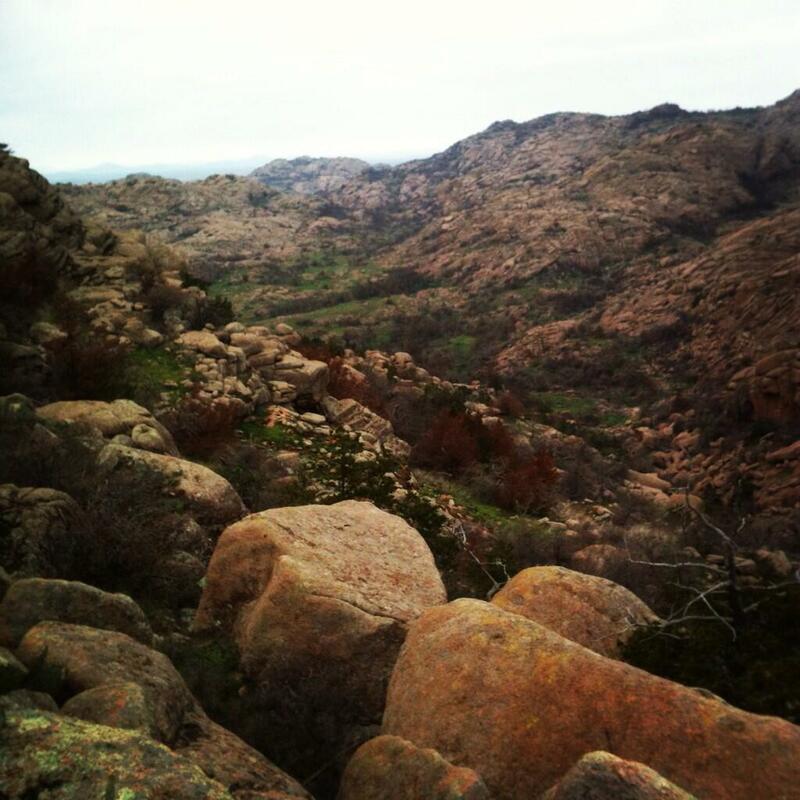 A few weeks back, I posted a trip report about a day trip me and a good friend of mine made to southwestern Oklahoma’s Wichita Mountains to knock off Twin Rock Mountain and Granite Mountain. I loaded that report up with photos I took with an iPhone3S, meaning that there were limitations as to how good those pics would be. Enter my friend Johnny Hunter. He’s one of the best hiking and climbing buddies you could ask for. He also takes a real camera with him, he knows how to use it and he comes back with great pics. As much as I liked the report, I think the trip deserves a better photographic treatment so you can get an idea how rugged and beautiful the Wichitas can be. 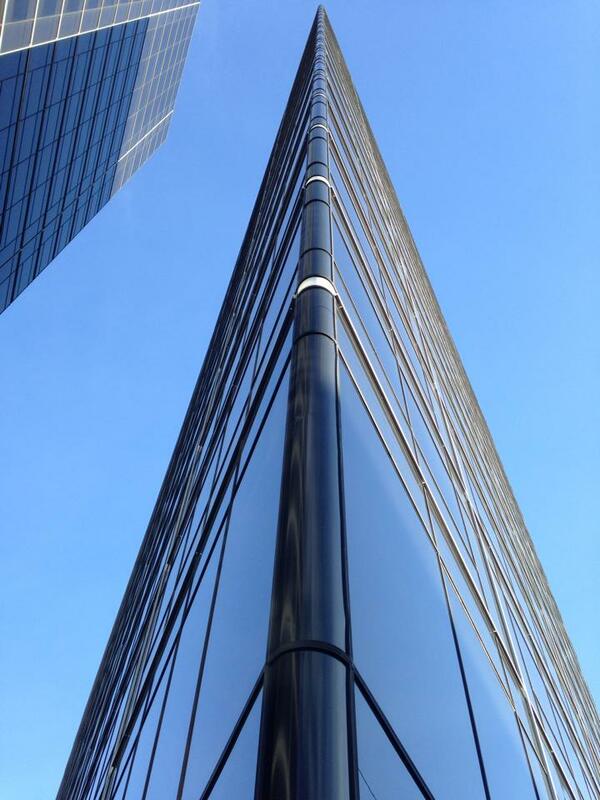 So that’s that this post is all about — a tribute to Johnny’s photographic skills. Zooming in, the landmark Crab Eyes formation just gets swallowed by the surroundings of the Charon’s Garden Wilderness Area. Here’s a rugged panorama of the northeastern side of Charon’s Garden’s peaks, with Elk Mountain and Mount Lincoln in view. A hiker’s and climber’s paradise. 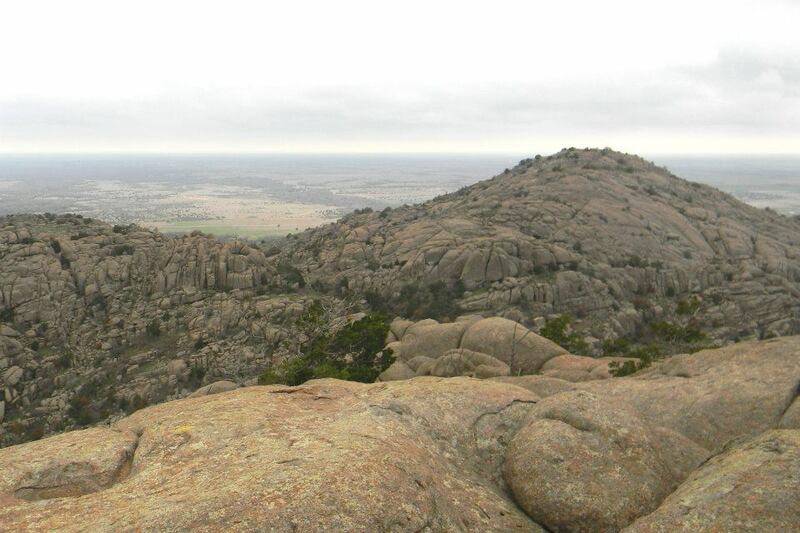 Just under the clouds are the summits of the Wichitas. Here, Johnny gets a moody shot of Granite Mountain from the summit of Twin Rock Mountain. Beyond is the vastness of the southern plains. 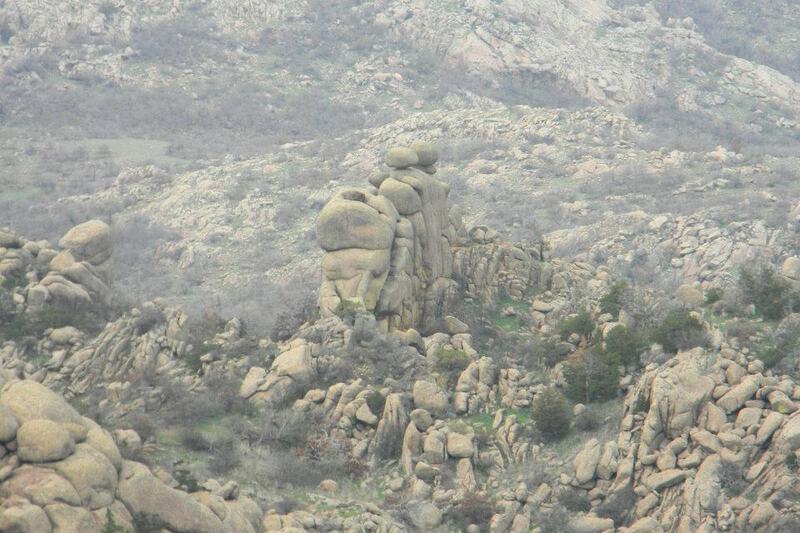 This image seems to capture the pain of what it’s like to live atop the Wichitas’ wind-scoured peaks. The common saying is that a picture is worth a thousand words. I don’t think I’ll ever get Johnny to write a guest post for me, but I’m glad he lets me use his photos. There’s more than one way to tell a story.